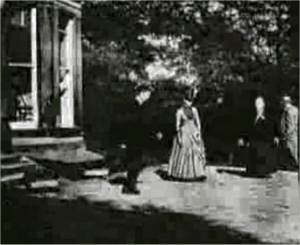 Roundhay Garden Scene, which is just over two seconds long and was made in 1888, is believed to be the world's earliest surviving motion-picture film. The elderly lady in black is Sarah Whitley, the mother-in-law of filmmaker Louis Le Prince; she died ten days after this scene was filmed. A silent movie is a movie made without sound. Silent movies were made from the late 1880s to the early 1930s. They used early cameras that could not record sound. Either the movie was being made before sound cameras were invented, or the movie makers could not afford the expensive new equipment. Charlie Chaplin was known as one of the best movie stars during "The Silent Era", as it's called today in movie history. Some silent stars also did well in sound movies. Popular silent movies include Nosferatu: A Symphony of Terror, A Trip to the Moon, The General, and Metropolis. A still from Saved from the Titanic (1912), which featured survivors of the disaster. It is now among those considered a lost film. Silent film Facts for Kids. Kiddle Encyclopedia.